Gaijin Entertainment today released content Update 1.83 “Masters of the Sea” for their vehicular combat MMO War Thunder. The comprehensive update opens the previously closed test of Naval Forces to all players, giving them command of over 80 vessels from the United States, Germany and Soviet Union. Furthermore, helicopters are now available to unlock, the game has become free-to-play on Xbox One and the update includes many other improvements, new features and vehicles for players to try. The anticipated public release of the Naval Forces for all players on PC and consoles is the biggest feature of “Masters of the Sea”, making 85 historically accurate ships from the United States, Germany and the Soviet Union now available to all players. On locations all over the globe, all War Thunder captains can now command a variety of warships, ranging from torpedo boats to cruisers, in challenging sea battles with and against other player-controlled ships and aircraft. While the battle for the high seas is on, a new Naval nation, Great Britain, enters closed testing with 26 ships alone, including the famous Flower-class corvettes – the symbol of victory for Britain. Players that wish to be among the first to try the British fleet can obtain tester access through in-game tasks or by purchasing a British naval pack in the War Thunder store. Development of the Naval Forces mode continues in full swing, with more nations to receive their own ship trees, more ships for existing trees, additional game modes and extended features all planned for future War Thunder content updates. Also now available are the recently introduced helicopters of the United States and Soviet Union, as well as an entirely new set of German helicopters debuting with this update. Helicopters are a new branch of modern vehicles available in War Thunder that excel in support duty against ground vehicles, but are vulnerable against attack, especially from the air. Players can employ their helicopters in combined arms battles including player-controlled tanks and aircraft, or partake in dedicated helicopter vs helicopter encounters featuring AI ground targets. With the pre-release phase on Xbox One coming to an end, War Thunder is now finally available as a free-to-play game for all current subscribers of Xbox Live Gold. Players on the console can now join their comrades-in-arms on PC in seamless cross-platform gameplay on tanks, aircraft, helicopters and, last but not least, ships. Extended features of the update include several new aircraft and tanks for the existing nations, such as the German Ju 288C bomber and Japanese Type 75 multiple rocket launcher tank, as well as new and improved locations and plenty of other changes and under-the-hood improvements. Recent economy changes saw significantly increased research point (RP) rewards for active ground forces players, especially during longer battles. More information about War Thunder Update 1.83 “Masters of the Sea” is available on the game’s official website: http://www.warthunder.com. Endsieg is due to release in November. For more game information please visit the official Order of Battle: Endsieg product page. 1C Entertainment today announced the launch of new Ostfront Veteranen DLC for the celebrated RTS series, Men of War: Assault Squad 2, which is the latest chapter in the award-winning and long-running Men of War strategy game series. The Ostfront Veteranen faction-based DLC, which is now available on PC via Steam for $9.99, expands the game with a brand-new unit selection available for the first time in the franchise—players can now join the battle as a new German faction with more than 10 new vehicles and hardened infantry squads from the brutal Eastern Front. The Men of War series has a storied and acclaimed history since first launching in 2009. In 2014, Men of War: Assault Squad 2 updated the game with significant tech improvements as well as new skirmish modes that take players from extreme tank combat to deadly sniper stealth missions. Commanders can face off against opponents on multiplayer maps ranging from 1v1 to 8v8 in scope, with a dedicated player community still ready to commence WWII battles on a daily basis. The base game, which is required to play the DLC, has been lauded as one of the great masterworks of RTS games, and currently has an 84% positive rating on Steam. The Ostfront Veteranen DLC continues developer Digitalmindsoft’s commitment to providing new and exciting content for the game’s active community with new troops, units, and features based on the Eastern Front. Men of War: Assault Squad 2 is developed by Digitalmindsoft and published by 1C Entertainment. The full game is priced at $29.99 on PC via Steam. Black Ops 4 is here! The best-selling series in Call of Duty® returns with Call of Duty: Black Ops 4 available now, digitally and at global retailers worldwide. The most anticipated multi-platform game of this holiday according to Nielsen Game RankÔ, Call of Duty: Black Ops 4 delivers a game-changing experience with more ways to play together with friends than ever before. Call of Duty: Black Ops 4 features three distinct modes of play: Multiplayer, Zombies and Blackout. Multiplayer features gritty, grounded combat in the most tactical, team-based experience in the Black Ops series to date. It features the return of the iconic Pick 10 system, along with a series of innovations in weapon controls, combat flow, health regeneration, and player movement. Black Ops 4 also features a combination of new and returning Specialists, each with their own unique equipment and playstyles, allowing players to not only be powerful alone, but devastating as a team working together. Celebrating the 10-year anniversary of the original Call of Duty Zombies, Call of Duty: Black Ops 4 debuts an entirely new Zombies experience that is the biggest Day One offering in franchise history, with three fully-featured Zombies experiences at launch – IX, Voyage of Despair and Blood of the Dead. With the most customisable action to date, the mode introduces new systems for creating and completing community challenges, and social systems designed to connect players. Call of Duty: Black Ops 4 introduces Blackout, an all-new Battle Royale mode that brings together characters, locations, weapons and gear from across the series in all-out survival combat, all with Black Ops signature gameplay. Blackout features land, sea and air vehicles, and offers a variety of new and classic playable characters, including campaign characters like Mason, Reznov and Woods; Zombies characters like Richtofen and Takeo; and Specialists like Crash, Battery and Seraph, to name a few. Across the sprawling Blackout map – the largest in Call of Duty history – players will fight in locations inspired by fan-favorite maps like Nuketown, Firing Range, Raid, Cargo and more. The release of Call of Duty: Black Ops 4 also heralds the biggest season to date in Call of Duty esports with $6 million in total season prizing on the line. The Call of Duty World League will get underway with the first open LAN event of the new season, Dec. 7 – 9, in Las Vegas. For more information, visit CallofDuty.com/CWL. In conjunction with the release of Call of Duty: Black Ops 4, the Call of Duty™ Endowment has kicked-off the #CODNATION Challenge, a live three-day charity event featuring Black Ops 4. Formerly known as the Race to Prestige, the annual stream brings together an array of video game personalities in a relay-style, fundraising gaming marathon. Across its nine-year history, the Call of Duty community has been instrumental in supporting the Endowment’s drive to place 50,000 veterans in high-quality jobs. The #CODNATION Challenge kicked-off yesterday and continues through tomorrow. Fans can watch all the action live on Twitch.tv/TheRace and follow @CODE4Vets for the latest updates and information for the #CODNATION Challenge. Additionally, launch is just the beginning for Call of Duty: Black Ops 4, which will feature a steady stream of post-release content across all modes, and a variety of free content for the entire community through a robust calendar of events, playable first on PlayStation 4. NVIDIA today released GeForce 416.34 WHQL “Game Ready” drivers. 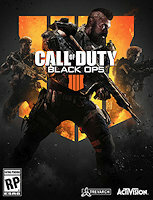 These drivers provide optimization for “Call of Duty: Black Ops 4″ (retail), “Soulcaliber VI,” and “GRIP.” Among the fixed issues with this release are buggy shadows in “Player Unknown’s Battlegrounds,” some games launching to a black screen when DSR is enabled, a colorful shimmering line noticed in some games when playing full-screen with G-SYNC enabled, Surround display not being available from NVIDIA Control Panel with Edge browser running, and green screen display corruption on certain games with HDR enabled. Grab the drivers from the link below. You can download the new GeForce 416.34 WHQL drivers through GeForce Experience or via GeForce.com. AMD has released the Radeon Software Adrenalin 18.10.1 Beta drivers. These drivers include support for Microsoft’s Windows 10 October 2018 Update as well as optimizations for Call of Duty: Black Ops 4. Along with improved support, AMD has addressed a number of issues with this latest release. First of which is a fix for the HDMI audio drivers not upgrading during the Radeon Software installation in some circumstances. Random reboots when upgrading from Radeon Software versions older than RSAE 18.8.1 on CPUs with more than 16 cores has also been resolved. In regards to gaming fixes, Fortnite sees lighting corruption when effects quality is set to High or Epic resolved, while Sea of Thieves sees texture flickering in multi-GPU configurations fixed. You can grab the drivers from the link below. The new Radeon Software Adrenalin 1810.1 Beta drivers are available online at the AMD driver download page. DCS: F-14 Tomcat Available for Pre-Purchase! The Grumman F-14 Tomcat was a two-crew, variable geometry, maritime air superiority fighter that served with the US Navy for 32 years and continues to serve with the IRIAF in Iran. The F-14 was the US Navy’s frontline fighter from the 1970s until the mid-2000s. Over the course of its long service life it also became the US Navy’s premier precision ground-attack platform and lone airborne reconnaissance asset.